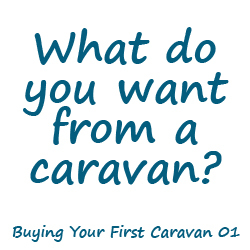 1: What do you want from a caravan? 2: What can you tow? Can you tow at all? 4: What about the caravan’s upkeep? 6: What equipment do you need for a caravan? What have we spoken about? Having read through the series you should probably have a better idea of the sort of caravan you would like to buy. Hopefully this has given you all the ammunition you need to start thinking about makin the final decision. 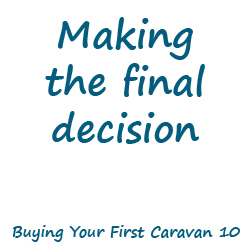 We started by discovering what you want from a caravan, where you want go, how long for and with whom as these can be important factors to take into account when considering your caravan options. Next we took a look at the towing laws and driving license requirements for towing a caravan. 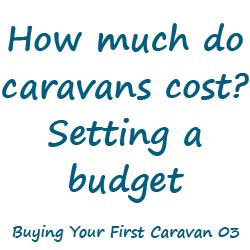 Then we moved on to talk about the cost of caravans, compared new against used and finished by setting an initial budget. The next subject was the upkeep of caravans, more specifically servicing and warranty requirements that caravans have. Next on the agenda was the subject of caravan insurance, I shared some tips with you to get a cheaper insurance premium and we also touched on storing your caravan and the benefits of storing at a CaSSOA registered caravan storage site. An integral part of caravanning is the equipment that you will need to get the job done, hence our next conversation being about the caravan accessory necessities. We then moved on to the different caravanning clubs and organisations that can help you in your adventures. 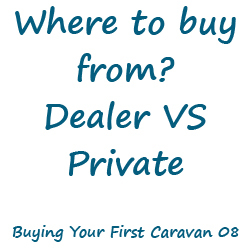 Next we considered you options of where to buy from and compared the pros and cons of buying privately against buying from a caravan dealer. Finally we brought the information to a close with some extremely useful tips for what to look out when viewing a caravan. “You mean there’s more?” (horrified face). Oh yes, there is plenty more. I am sure you will still have loads of unanswered questions and maybe even more than you had to begin with. It is often the case that in order to answer a question, you must create another. I am here and happy to help you, if I don’t know the answer then I’ll know where to look to get it. You could also look to the Caravan Club or the Camping & Caravanning Club for more help and advice. What can I say? I already summarised what we spoke about in the last 9 posts and so today I just told you what I already told you! As always, thank you very much for reading and I hope if you like what you have read you will subscribe to the mailing list using the box in the top right hand corner of the page, also if you are on Facebook, head on over to our Facebook Page and join in with the fun.